cavan-st-columbas -- In | Loving Memory of | PHEBE THOMPSON | of Derrygeeraghan| Who died 30th (?) Dec 1924 | Aged 72 Years | Also her husband | JAMES THOMPSON | Died 14th September 1928 | Aged 78 Years | Also Their Daughter | MARGARET JANE HALL | Died 21st (?) 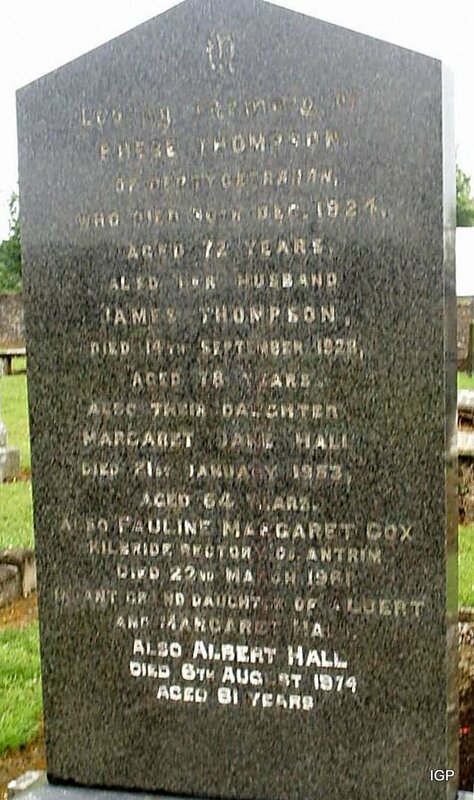 January 1853 | Aged 64 Years | Also PAULINE MARGARET COX | Kilbride Rectory , Co. Antrim | Died 22nd March 1981 | ... Grand Daughter of ALBERT | and MARGARET HALL | Also ALBERT HALL | Died 6th August 1974 | Aged 81 Years.